Marvel directors, producers, and showrunners are known to hide clever, comic-inspired Easter eggs throughout their projects, and fans are usually quick to find each and every one of them. However, the Cloak & Dagger showrunner managed to sneak a SUPER deep cut into last week's premiere and not a single one of us caught it. This week, ComicBook.com had the chance to speak with Joe Pokaski about the new series, and we asked if there were any Easter eggs that no one had picked up on yet. "There's, you know, here's the thing," Pokaski said. "I put two stupid initials on a towel, don't think anyone's going to catch it, and as four articles about it. So it's hard to slip something by the MCU, but I think something I was surprised didn't get caught, and maybe it was because you never quite read the shirt, was there is a Marvel band on Tandy's shirt when she goes to the party and is the cemetery, which there aren't many, which I was very excited about. I think they're going to become, we're going to see a little more of that band in seasons to come." After hearing this from Pokaski, we dug around and, sure enough, Tandy's t-shirt is indeed a band from the pages of Marvel Comics. Ever heard of the Crick-Hits? Yeah, we hadn't either, but that's the band that shows up on Tandy's shirt in the episode. Take a closer look at the photo below, and you'll totally be able to see it. The Crick-Hits are a pop-rock band that only appeared in two comic issues. They first showed up in The Age of the Sentry #4 in 2009. According to the Marvel Database, the Crick-Hits, of Earth-1611, are comprised of Jane Stalling, Peter McMary, Harris Fils, and Bangs Nova. Of course, these names are all plays on The Beatles. The best part about this Easter egg is the fact that the band will appear on the show again in some capacity. We aren't sure whether the band members themselves will be characters on the show, or if there will just be other shirts and posters acknowledging their existence. Either way, we now know that Pokaski and his team are low-key Easter egg ninjas and you can bet we'll be watching Cloak & Dagger a lot more closely from now on. 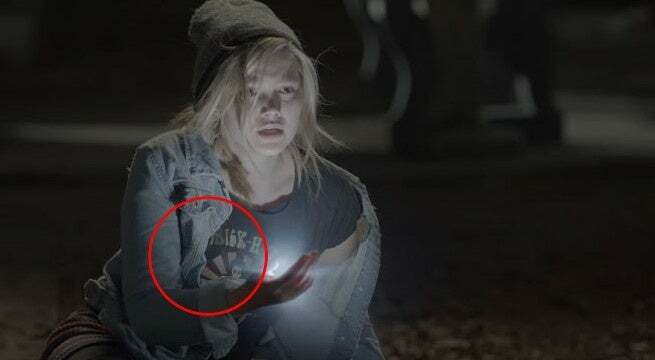 Did you catch any other Easter eggs in Cloak & Dagger premiere? Let us know what you noticed by dropping a comment below! New episodes of Marvel's Cloak & Dagger air on Thursday nights at 8pm ET on Freeform.